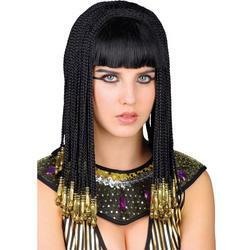 Get the look of a powerful ancient ruler and seduce your very own Julius Caesar with this flawless Cleopatra Fancy Dress Costume. Live on the pharaoh’s legacy in this beautiful strapless dress, with black horizontal panels and gold glitter trim on neck and hemline, with a seductive slit up the front. Completing the Greek ruler fancy dress costume is an eye catching gold coloured headpiece. 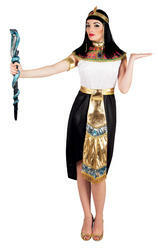 Perfect for Egyptian themed events and a great couple costume idea when teamed with a Caesar costume.